Vincenzo Lancia was born near Turin, Italy in 1881. From an early age, he demonstrated an aptitude in mathematics, and his father encouraged him to become an accountant. However, Lancia was mainly interested in machinery and engineering. By the age of 17, he worked as a bookkeeper for a small bicycle and auto repair shop, operated by the Ceirano brothers. There, he became more of a mechanic’s assistant than a bookkeeper. When the shop built an automobile, FIAT bought the business and made Lancia, who was only 19, chief inspector of their new factory and also a test driver. His driving skills impressed FIAT, and they later made him a race car driver. 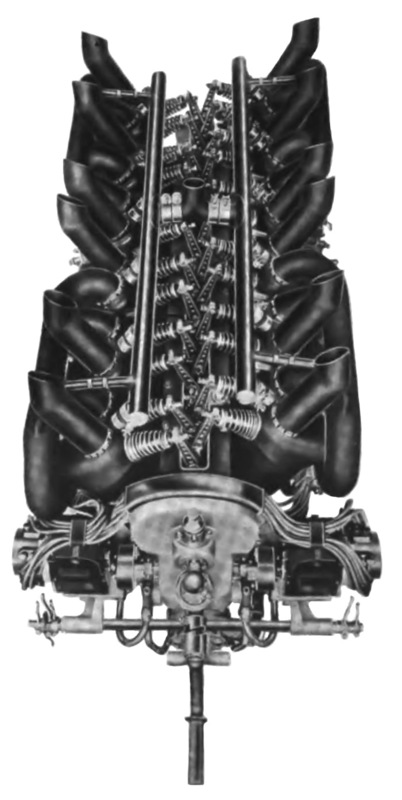 The Lancia Tipo 4 V-12 aircraft engine displaying its individual cylinders and distinct valve train. The engine was configured for pusher installations, which is why exhaust was expelled toward the propeller. But Lancia wanted to design. In 1906, at the age of 25, he and another FIAT worker founded their own car company: Lancia & Company. Lancia and his company produced a number of vehicles and engines and became known throughout Europe. Always experimenting and innovating, Lancia took out patents for a narrow Vee engine configuration and an offset crankshaft in 1915. World War I interrupted plans to use the design for an automotive engine but gave Lancia incentive to build an aircraft engine. Known as the Tipo 4 (Type 4), the Lancia V-12 aircraft engine was water cooled and had a 50-degree angle between the cylinder banks. The engine’s individual steel cylinders were mounted to its aluminum crankcase, with a deep oil pan. Each cylinder had one intake and one exhaust valve perpendicular to the cylinder axis. These horizontal valves opened into a small, rectangular clearance space above the cylinders that extended the combustion chamber above the piston. The valves were actuated by long rocker arms positioned in the Vee of the engine. A single hollow camshaft positioned in the middle of the Vee acted upon the rocker arms. The camshaft was driven from the crankshaft at the rear of the engine. The valve train was very similar to that later used on the Duesenberg Model H aircraft engine. 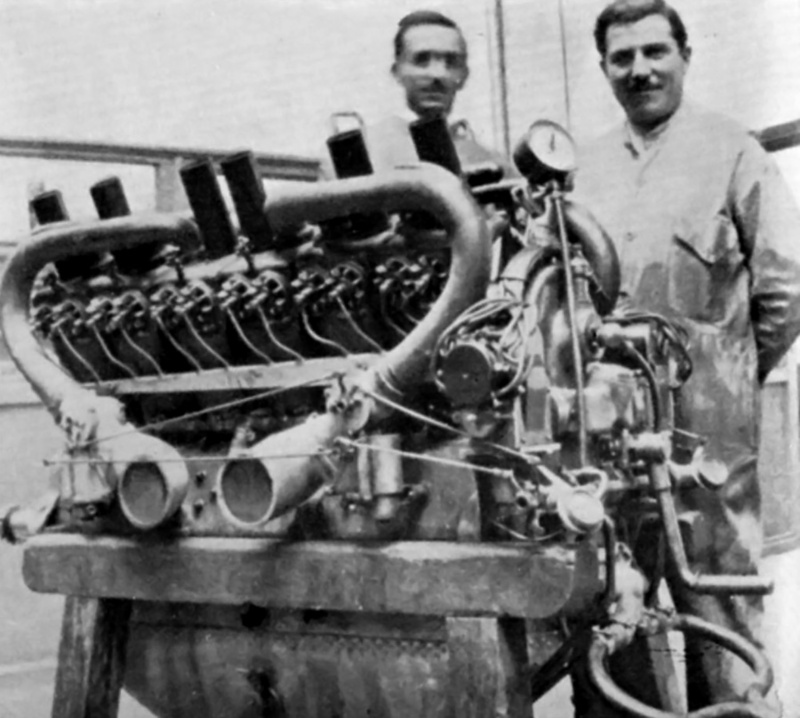 Two technicians stand next to the Tipo 4 engine. Note the straight exhaust stacks. This is thought to be the prototype Tipo 4, and it closely resembles the engine that is preserved in the FIAT/Lancia archives. Each cylinder had two spark plugs that were positioned on the opposite side from the valves. Two magnetos were located at the rear of the engine, each firing one spark plug per cylinder. One of the magnetos could be replaced by a distributor. Two Claudel-Lancia carburetors were mounted on each side of the engine. Each carburetor supplied air to three cylinders via a manifold that looped above the cylinders. A section of the intake manifold was jacketed to use engine cooling water to heat the air/fuel mixture as it traveled to the cylinders. Exhaust was expelled via a short manifold extending above each cylinder. The hollow crankshaft had six throws and used a side-by-side connecting rod arrangement. However, to compensate for the odd Vee angle, each cylinder had its own crankpin that was slightly offset (displaced) from the crankshaft’s center. Cast aluminum pistons and pressure lubrication were used. Cooling water was pumped into the jacket around each cylinder’s barrel via manifolds on each side of the engine. The water then flowed up into the cylinder head and finally into a manifold that took it back to the radiator. Side view of the Lancia Tipo 4 illustrating the two carburetors and intake manifolds on the side of the engine. Note the two spark plugs for each cylinder. The Tipo 4 had a 4.75 in (120.7 mm) bore and a 7.09 in (180 mm) stroke. Many sources state the bore was 4.72 in (120 mm); however, all primary source material from Lancia indicates the bore was 120.7 mm (4.75 in). The engine’s total displacement was 1,508 cu in (24.7 L). It produced 320 hp (237 kW) at 1,380 rpm and 380 hp (283 kW) at 1,420 rpm. The Tipo 4 engine was direct drive and weighed 740 lb (335 kg). A good view of the Lancia Tipo 4 showing the two magnetos, open gear train, coolant manifolds, and hand crank at the rear of the engine used for starting. 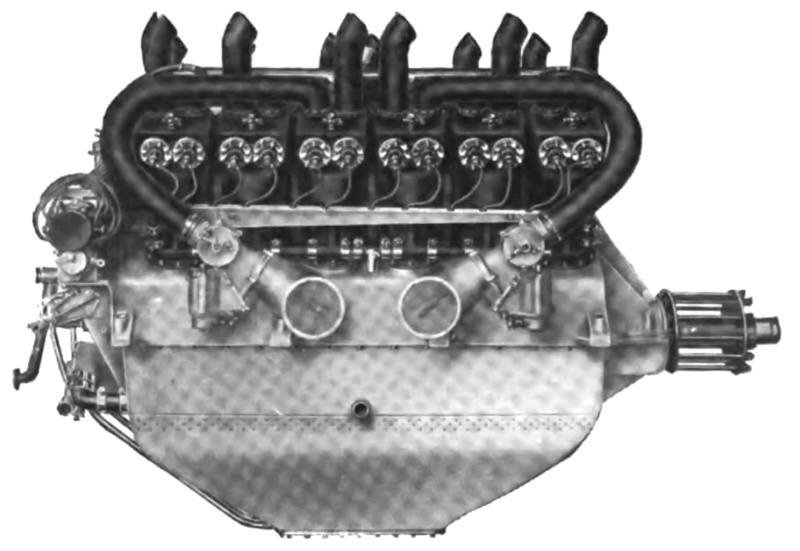 The Tipo 4 aircraft engine was built in 1916. 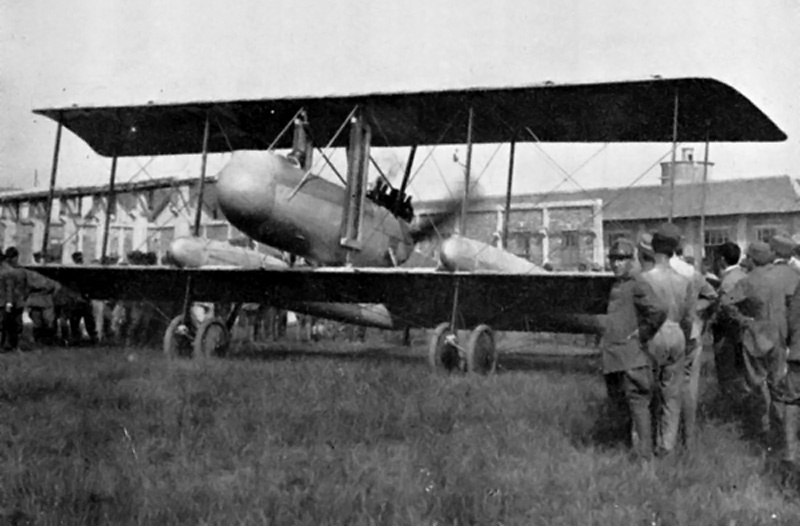 It was installed in the Caproni Ca 37 and Ca 38 aircraft. These relatively fast aircraft were light-bomber / ground attack prototypes. 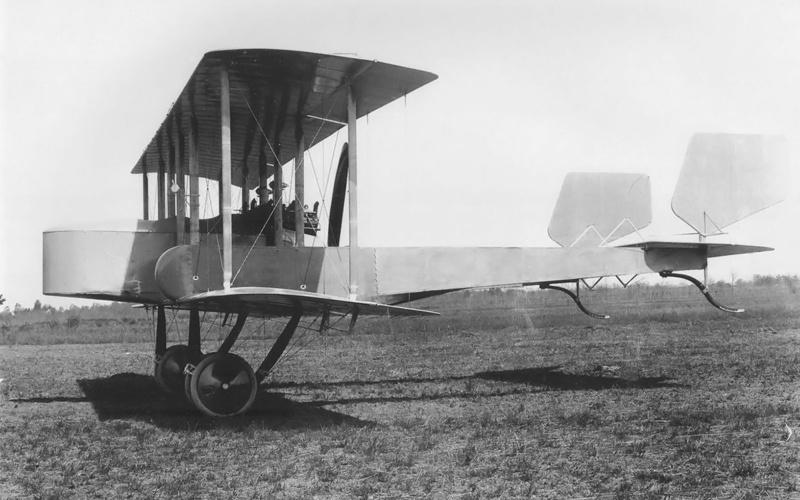 The Ca 37 flew in 1916, and the Ca 38 was a more refined version of the aircraft that flew in 1917. Neither aircraft entered production, and it is not clear if the Tipo 4 engine was installed in any other types. At least one Tipo 4 engine was shipped to the United States in late 1917. Thomas Evarts Adams, Inc represented Lancia & Company in New York and initiated the process of producing the engine in the United States. The engine was on display until early 1918 when it was sent to McCook Field, Ohio for testing by the US government. The Tipo 4 was tested in May and July 1918 and did not develop the anticipated power. On test, the Tipo 4 produced 279 hp (208 kW) at 1,250 rpm and 305 hp (227 kW) at 1,400 rpm. Plans for producing the Lancia Tipo 4 V-12 never moved forward. The end of World War I caused a large influx of surplus aircraft engines that left aircraft engine manufacturers with a very small market. In addition, the US government was interested in the more powerful Tipo 5 (Type 5) engine that Lancia was designing. A Tipo 4 engine is preserved in the FIAT/Lancia Archives in Turin, Italy. The design for the Lancia Tipo 5 V-12 engine was well underway by the end of 1918. The Tipo 5 was very similar to the Tipo 4; however, there were a number of differences between the two engines. The Tipo 5 had a larger bore and a 53-degree angle between its cylinder banks. The Tipo 5 did not have offset crankpins; the engine used an early style of a fork-and-blade connecting rod design. The straight fork rod was relatively thick, and this size allowed the blade rod to connect to the same crankpin via a cut-out section of the fork rod. The Tipo 5 did not have the deep oil pan like the Tipo 4. The Tipo 5 had a 5.91 in (150 mm) bore and a 7.09 in (180 mm stroke). The engine’s total displacement was 2,329 cu in (38.2 L), and it was forecasted to produce approximately 600 hp (447 kW) at 1,700 rpm. The Tipo 5 weighed 992 lb (450 kg). No verifiable proof has been found that a Tipo 5 engine was ever built. The Caproni Ca 38’s fuselage and tail booms were more rounded and streamlined compared to those of the Ca 37, but the aircraft were otherwise very similar. The Ca 38 flew in 1917 and had a top speed of 106 mph (170 km/h). The Ca 37 and Ca 38 never entered production. They are the only known applications of the Lancia Tipo 4 engine. 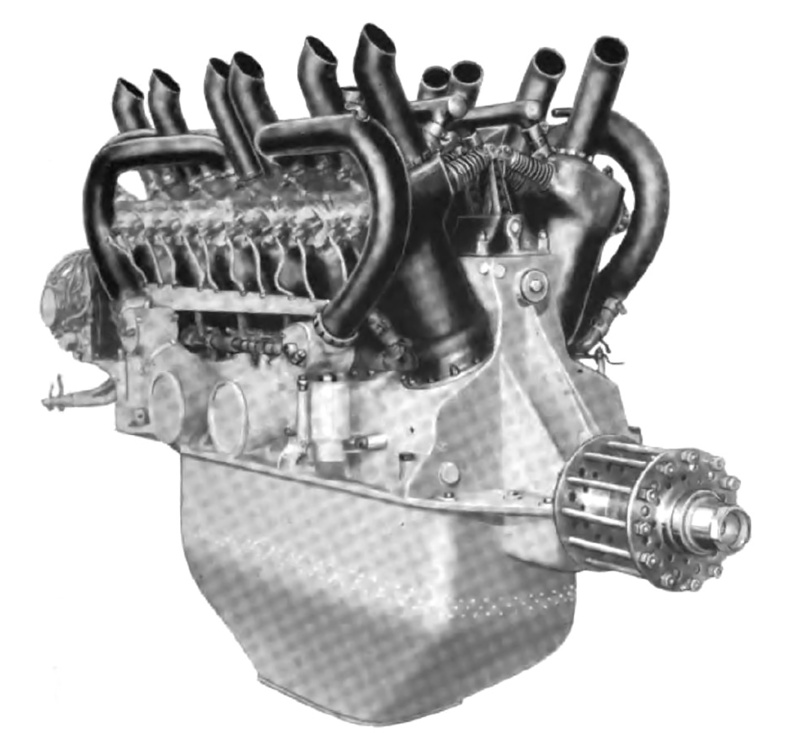 Through the early 1920s, Lancia designed at least two additional V-12 engines for automotive use, one of which had a cylinder bank angle of 14 degrees (connecting rod angle was 22 degrees). None of the V-12 engines entered production. However, these engines led to a range of narrow V-8s and V-4s that Lancia produced starting in the 1920s. Narrow V-4 types were in production until the 1960s. 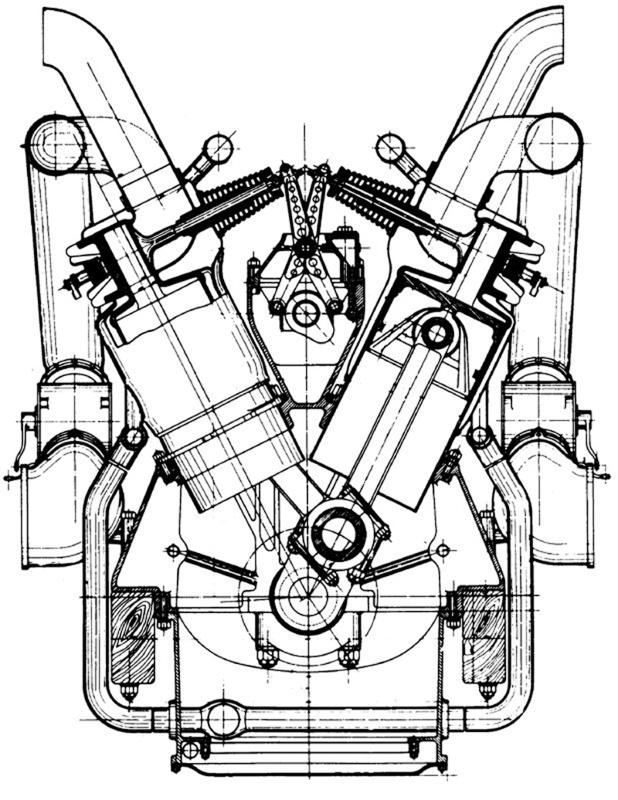 Sectional view of the Lancia Tipo 5 V-12 aircraft engine showing a 53-degree angle between the cylinder banks. Note the long rocker arms, horizontal valves, and small space above the combustion chambers. This configuration was very similar to the Tipo 4 and early Duesenberg engines. This entry was posted in Aircraft Engines, Through World War I on 9 March 2014 by William Pearce.